‘Draft Day‘ is another US Sports film unable to get a wide UK release (following last year’s Jackie Robinson biopic ’42’), but since I’m a sucker for a good sports movie (and by that, I mean any sports movie! ), I sourced this one out and watched it last night. 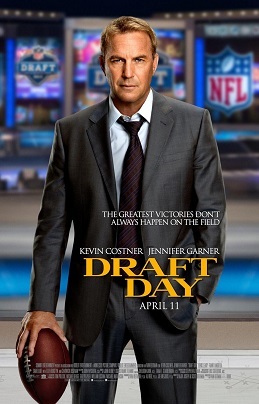 Starring Kevin Costner as the Cleveland Brown’s General Manager, it follows his footsteps throughout the crucial NFL Draft Day, as he plans his picks, makes deals and trades with other teams, and has to endure the challenges and questioning from other key personnel at the team. The initial stages of the film struggle to really invest the audience, with endless scenes of exposition designed to explain the rules of the draft and the process, and whilst this is beneficial to someone like me who doesn’t follow the NFL, it doesn’t strike the balance as well as it could. The key factors that keep the film watchable through these early stages is the strong performances and the countdown to the draft itself, where we know things are likely to liven up. Kevin Costner is an icon of US Sports films, and he’s well cast in the lead role, trying to balance the wants and expectations of colleagues, players and fans. The support is extensive, with a raft of strong TV actors mixed in with upcoming and established stars such as Chadwick Boseman (also in ‘42‘), Jennifer Garner, Denis Leary and Frank Langella. As mentioned previously, the film steps up a gear as we approach the draft and the concluding half hour is thoroughly enjoyable and suitably exciting, as the pay off from all the earlier negotiations leads to interesting and surprising changes. The film is unlikely to find a wide audience, particularly outwith the US, but this is a solid watch for fans of sports movies and I enjoyed watching it.